This year, 2015-2016, The North Shore Civil War Roundtable is celebrating its 20th year anniversary. We've decided to present to our members a very special program to commemorate the occasion. 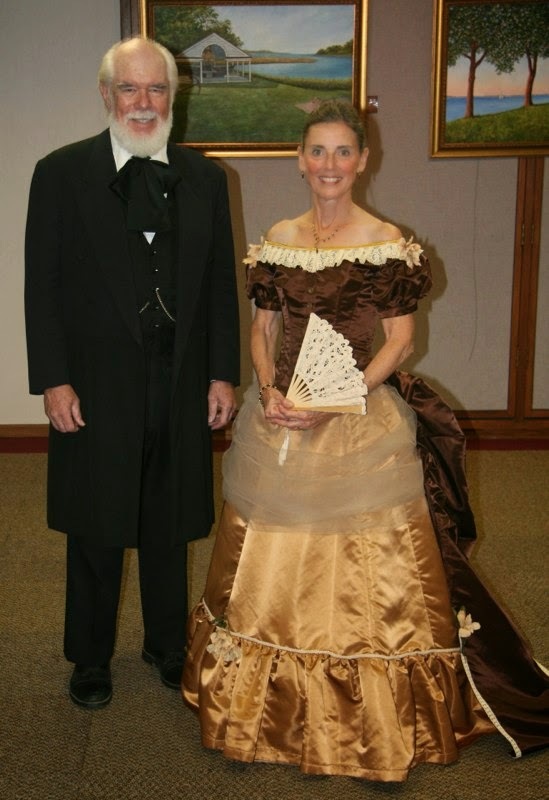 Frank Hendricks and Linda Pratt Will present a musical program called Manners and Mores of 19th Century America. Actor/baritone Frank Hendricks and pianist/singer Linda Pratt are seasoned performers specializing in the popular music of mid-nineteenth century America. Costumed in period attire and accompanying themselves on piano, guitar and banjo, they present an intriguing and highly entertaining concert program of musical Americana. Their entertainments, which offer engaging glimpses of life in the 19th century, are drawn from a large repertoire of songs and compositions, both popular and classical, comic and melodramatic, familiar and novel. Frank has been performing traditional American music since the folk revival of the 1960’s. His musical training includes six years of vocal studies with New York City Opera bass, Peter Maravel. For the past several years he has been a performer of 19th century songs with his group, STOUT, at the Long Island Fair at Old Bethpage Village Restoration. He has also appeared in numerous musical theatre productions throughout Long Island as Emile DeBecque in South Pacific, Tevye in Fiddler on the Roof, King Arthur in Camelot, Don Quixote in Man of La Mancha, and many others. In addition to William Cullen Bryant, Frank has portrayed 19th century author Herman Melville in a one man show conceived by his wife, Millie Hines. Linda majored in piano with Lucille Richardson while earning music education degrees from SUNY College at Fredonia. For many years she enjoyed teaching elementary school music, and more recently, supervising student teachers of music and mentoring newer teachers for local colleges and school districts. She has sung with What Four, a vocal quartet, and is very active as an accompanist for vocal and instrumental soloists, and school and community choral groups. She appears at Nassau County's Old Bethpage Village Restoration and formerly at Cedarmere Museum playing period parlor organ and piano music. Her firsthand knowledge of what was actually in Long Island piano benches comes from having catalogued the county's entire collection of 19th century music.